I'm taking part in the online Christmas CRAFTfest extravaganza next weekend - it promises to be an exciting event as there will be 100s of different virtual stallholders all offering a huge selection of beautiful handmade crafts! It's the perfect venue for all your Christmas shopping, so why not pop along to CRAFTfest now for a sneak preview of all the stalls, and don't forget to visit us next weekend! As a special promotion for this event, you can enjoy a 10% discount off my jewellery over the weekend - ONLY available to visitors to my Erika Price CRAFTfest Stall! 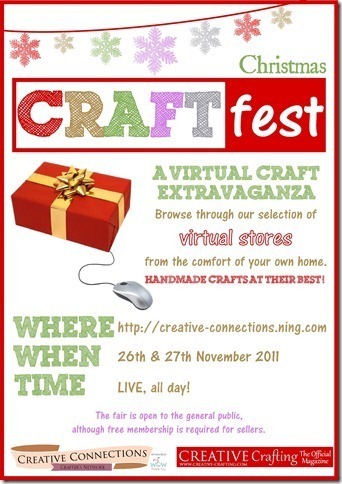 Drop by my stall to find out how to get your discount - I'm adding new pieces all the time, so pop in often.